Springtime means Scene time in Ottawa. The sixth in a series of national festivals that showcase the country’s breadth of artistic talent is back for another round of revelry, this year giving a nod to Canada’s north. Starting April 25, some 250 artists take part in 50 events over 10 days. Worried you can’t get to everything? Heather Moore, producer/executive director of Northern Scene, narrows it down, offering her five picks (and the peeps they’ll appeal to). Swarm include 15 exhibits, live music, and a fashion show. SWARM is your event if you like the idea of experiencing everything in one night — a gallery crawl to 15 art exhibits is followed by a party at the NAC that includes an unconventional fashion show, DJs, live music, and performance art. And it’s free! It’s a north-south gourmet mashup! Three chefs from north of 60 — Yukon’s Michele Genest, NWT’s Robin Wasicuna, and Nunavut’s Rebecca Veevee — show three local chefs a thing or two about northern cuisine. Les Fougères’ Charles Part, Fraser Café’s Ross Fraser, and Le Café’s John Morris take on the challenge. If you’re looking for a shot of Arctic adrenalin, look no further. Nunavut alt-rocker Lucie Idlout’s music is brooding, smouldering, and passionate. Yukon’s Speed Control delivers high-octane, beat-driven rock, while NWT’s Digawolf mixes tradition and innovation with incredible guitar technique. Tulugak is a charming collection of raven stories. More than a film, this is an event! Take a 1923 black-and-white silent film consisting of comedy, romance, and adventure in the Klondike; add new dialogue from Shakespeare and a new musical score; perform it live with an ensemble of 12 in front of a giant screen. The result: The Grub-Stake Revisited. 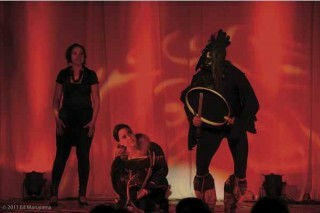 Tulugak is a charming play, beautifully performed using masks, wonderful costumes, music, and circus. Director Sylvia Cloutier is an amazing creative force who has brought together the best artists from Nunavut, Nunavik, and Greenland for this tale of raven stories from across the North. Northern Scene runs April 25 to May 4. Check the website for a full list of events, locations, and ticket info.